Saturday Feb 3rd saw 114 people descend upon the velodrome track at Derby Arena for our first East Midlands Cyclone24 challenge. The cyclists taking part covered 66,468 laps in total, an outstanding 10,325 miles; the equivalent of cycling further than Derby to Brisbane, Australia! And raised over £20,000 for charity with money still coming in! We can’t say we were surprised by the team who took the top spot, who also smashed through the previous Cyclone24 UK laps record of 3792, with 2 hours remaining on the countdown clock and set a new fastest lap record. We can’t say we were surprised because we’d heard of some of the riders before, perhaps you have to? 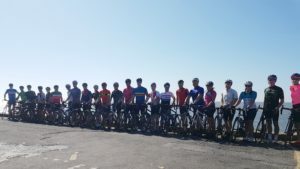 The six man team from the Derbyshire Institute of Sport, led by team captain Michael Kirkland, consisted of Harry Tanfield, Jonny Wale, Jacob Tipper, Simon Lewis and Adam Kenway. The team cycled 4169 laps in total, not only making them champions of this event, but also taking them straight to the top as overall challenge record holders. All teams got off to a great start, with some setting off at a great pace. But could it be sustained? At 4 hours in the DIS team were already claiming the top of the leaderboard, with teams from PKF Cooper Parry, Wymeswold Cycling Club and Rogue Resolutions hot on their heels just 30 laps or so behind. There was some mid table competition going between teams, with riders from Team Anaesthesia, BWB Consulting and The Radiology Rollers all less than 10 laps apart. At 6 hours in the top of the leaderboard remained the same, only with Team DIS setting a new Cyclone24 record of fastest lap, with 14.37 shedding a whole second of the previous record of 15.36. Meanwhile the team from the Derbyshire Constabulary were top of the Corporate Cup leaderboard with a healthy lead of 64 laps. As we approached the half way marker there was a mid table competition brewing with RA Tech UK (a team of transplant recipients), Team Anaesthesia and Walsall Roads CC all on 1620 laps and riding together in a group! In the corporate cup challenge, Derbyshire Constabulary were still out on front, but Faithful & Gould, BWB Consulting and the Radiology Rollers were all battling it out between them. And our first ever tandem team had clocked up an amazing 1545 laps and were sitting in 13th position. The pace slowed a little through the early hours, but the cycling continued, with team members getting maybe an hour or two of shut eye in between stints out on track. At 4am the top of the leaderboard had changed a little, no signs of shifting the DIS boys off the top spot, however, Wymeswold CC had moved up to second and were sitting on 2611, Rogue Resolution were in third on 2589 (on just 4 riders) with PKF Cooper Parry just laps behind on 2583. There was also some healthy competition going on between Prime Accountants and Mitie/Rolls Royce who were on 2070 and 2062 respectively, more importantly it would appear pizza had been delivered and we had missed it!! At 6am we hit the music button to give everyone a little lift and with sunrise approaching the mood and pace lifted! With just a few hours to go teams were remaining positive and adrenaline was seeing them through to completing the challenge (or was it the various deliveries of McDonalds breakfasts) and friends and family were arriving to see the finish. 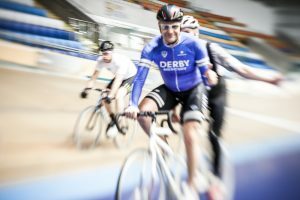 Final figures of our Derby Arena challenge saw teams amass 66,468 velodrome laps, an outstanding 10,325 miles. The podium was certainly very ‘local’ with the team from Derbyshire Institute of Sport, who covered 4169 laps, taking the top spot and the team from Derbyshire Constabulary claiming the Corporate Cup, covering 3759 laps and our award for best team kit went to RA Tech UK. Our Derby event has certainly set the pace; the top four teams on the leaderboard all went over the existing laps record with PKF Cooper Parry finishing on 3912, Wymeswold CC on 3896 and Rogue Resolutions on 3839 and every team went over 3000 laps which is a first for Cyclone24! Congratulations to all who took part in the challenge, and huge thanks to our event sponsor Stills Branding, and to our event support partners Impact Physio, Cycle Republic and Sportsshots Photography. We look forward to seeing you on the boards again soon. And if you’re really keen our next challenge takes place at the Wales National Velodrome on 21st – 22nd October 2018, of course we’ll be back at Derby in 2019!